It is there, stark and alone, where “Sloop John B” finds its place. Long acclaimed as a soundtrack for coming-of-age, Pet Sounds runs the listener through a gamut of intense highs and impossibly depressing lows, all in under thirty-six minutes. Maybe the real break comes in the track before “Sloop John B,” with the instrumental “Let’s Go Away For Awhile,” which has more than enough going on to keep you focused without introducing three-part harmonies. The idea that a band heretofore known mostly for its melodious euphony could leave the listener for two tracks – the second being the album’s penultimate title track – must have absolutely rattled its audience at the time, perhaps not unlike a lover taking an unexpected leave of absence from a relationship. Taking the Beatles’ Rubber Soul as a challenge, Brian Wilson set out to create the greatest rock album ever, having already begun to push the sonic limits of studio experimentation as far as it could be from 1965’s “California Girls” onward. Wilson’s drug use, especially with psychedelics, played a part too, as did the growing conflict within the band about his overall mental state, but not just any fragile public figure dropping acid could’ve produced what Wilson did. From the start to finish, Pet Sounds isn’t so much about fulfillment as it is about possibility. For all its praise as a tale of hopeful young love, “Wouldn’t It Be Nice” leaves us with the strong implication that some dreams are meant to be left unrealized, at least for the time being. That alone speaks to the state of almost anything you dare to impress upon it: drug-dependent genius Brian Wilson; the Beach Boys’ expectations as surf-gone-art band post-Pet Sounds; the United States in the midst of several cultural revolutions, not to mention a full-on military conflict yet to fully escalate, in 1966; any number of you and your single friends going to a bar to hobnob with strangers over PBR, well liquor and pretty much anything besides Pet Sounds emanating from the speakers. Despite Brian Wilson’s best efforts, Pet Sounds isn’t really a rock album. It isn’t really anything easily classifiable, though it best falls somewhere between baroque pop and psychedelia. The endless tinkering Wilson conducted, the miles of tape sacrificed in the name of getting the sound out of his head and onto a record player, has reached a point of cultural awareness bordering on parody; indeed, Portlandia has taken its shot at Wilson’s precision and, more closely, the legions of artists striving for the same level of authenticity which bred the album. Along with its soaring melodies, a notable lack of easily identifiable instrumentation contributes to the overall vibe of Pet Sounds. Leaving behind the typical guitar-bass-drum basis of rock music, Wilson introduced orchestral performers and had session musicians beat on random household objects in order to transport the listener from anything realistically terrestrial or familiar. Even though some instruments sound like they were recorded a mile away from the microphone, each layer leaves the impression that without it, the whole soundscape would be completely different. All of which makes Wilson’s current touring of the Pet Sounds album in full even more astounding. Representative of the songs that follow, “Wouldn’t It Be Nice” challenges the listener with its wistful lyrics juxtaposed against an undeniably joyous melody. 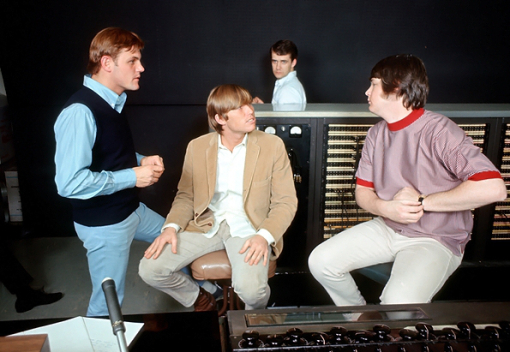 That dichotomy showcasing the duality of man, the Jungian thing, has long made for great pop music fodder, but the Beach Boys’ submission to this endless catalog is perhaps more influential than any other, even from their rivals the Beatles. Brian Wilson turning a Bahamian folk song into an anthem for a night, or a life, gone awry fifty years later – that’s why Pet Sounds still matters.